I have encountered this interesting article from Charles Schwab today and it describes some study (done on the index) over several different time periods. The result show the returns of putting money to work immediately. The interesting result is that perfect timing is not substantially larger than putting money to work immediately. Putting money to work immediately usually offers slightly higher returns than dollar cost averaging. 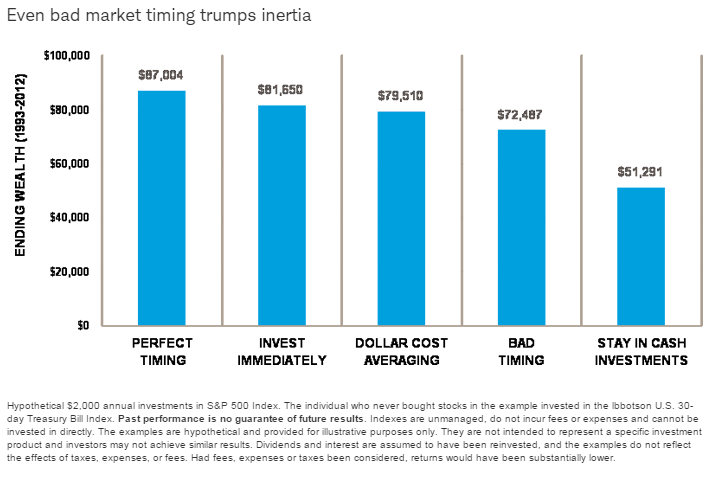 Surprisingly, timing the market at the worst time (but staying invested nonetheless) is still better than holding all cash.